a Tech flicked a switch, the heavens opened up with a bolt of lightning and Tone entered the world! Little did he know that this simple act would set him on a path for Tone that would consume his life for the next 20 years. 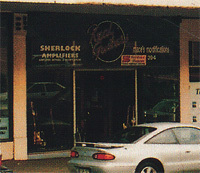 It was the beginning of the 90's, In the back room of a house in the Dandenong ranges, on the outskirts of Melbourne, the first of the Sherlock tube amp family was born! The very first production Signal Station preamp was completed and ready for sale! 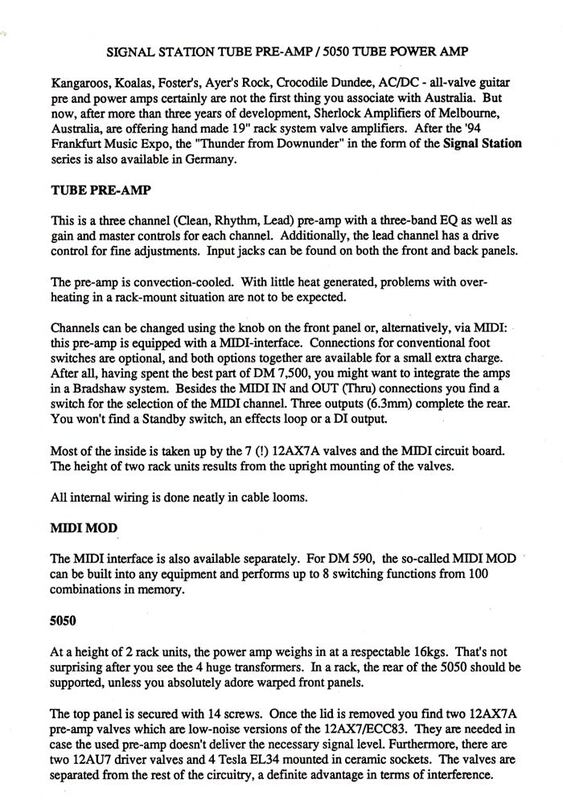 At the time there weren't too may all tube, rack mount guitar preamps that sounded good in Australia so they sold quickly and became very popular. Then of course the preamp needed a power amp to go with it, so next to roll off the design bench was the 5050 rack mount stereo power amp. These were a big success too. But it wasn't good enough...guitar players wanted more power. Ther insatiable hunger for tone and volume saw the first 2100 all tube rack mount monster born. Now they were loud enough! So now I could rest! But no, not yet. In those days, every guitarist had a rack the size of a bar fridge, full of amps and preamps and digital effects units, pulling heavy crunch rhythm sounds and hi gain solos with deep delays. But my pre-amps were not able to be integrated into the MIDI controlled world of digital effects so back on that bench, the Midi Mod was created! 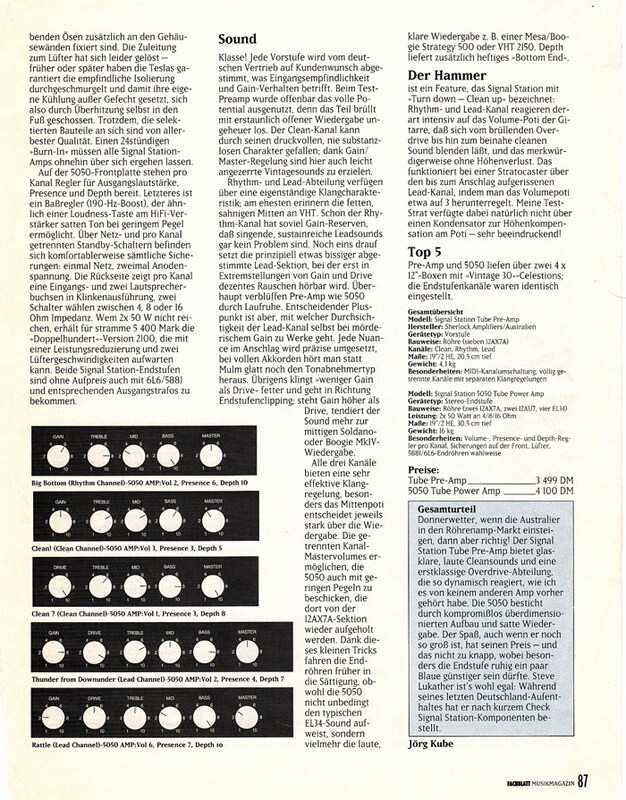 Now my preamps could change channels when the Digital Effects units changed patches! Awesome! And now I didn't do it all on my own so I can't claim all the credit. 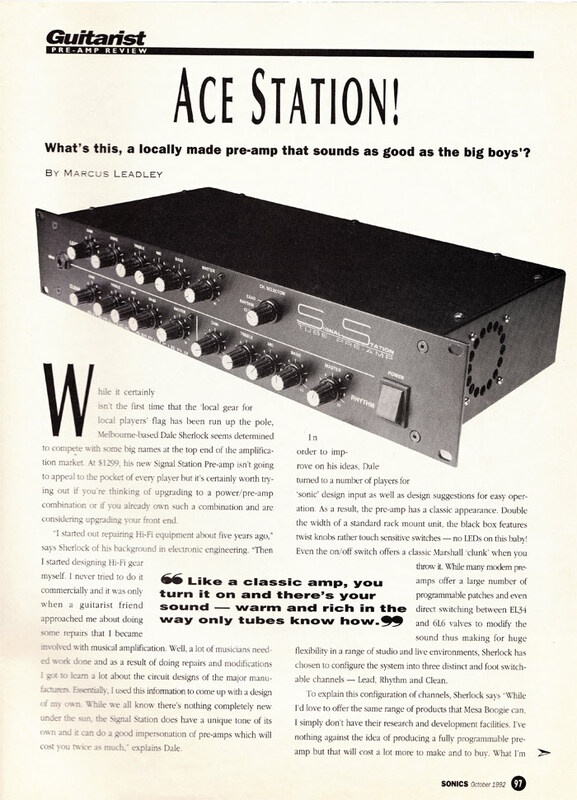 A friend at the time, by the name of Steve Pearce who had and still does have a very critical ear for great tone and owned all the latest gear became my ears for a time until i developed my own sense of tone. 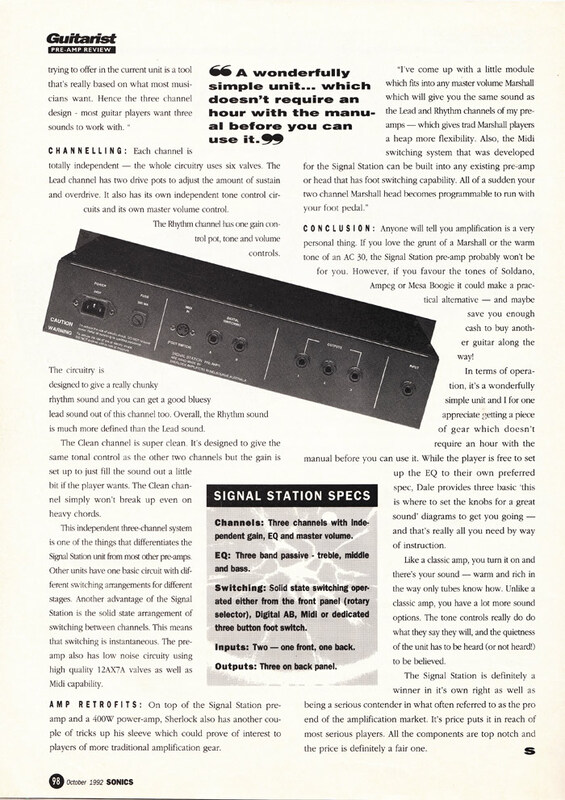 Steve played a big part in the development of the earlier Signal Station gear. Later on we parted company. So now you may think I was a tube amp expert at that stage, but I didn't think so. 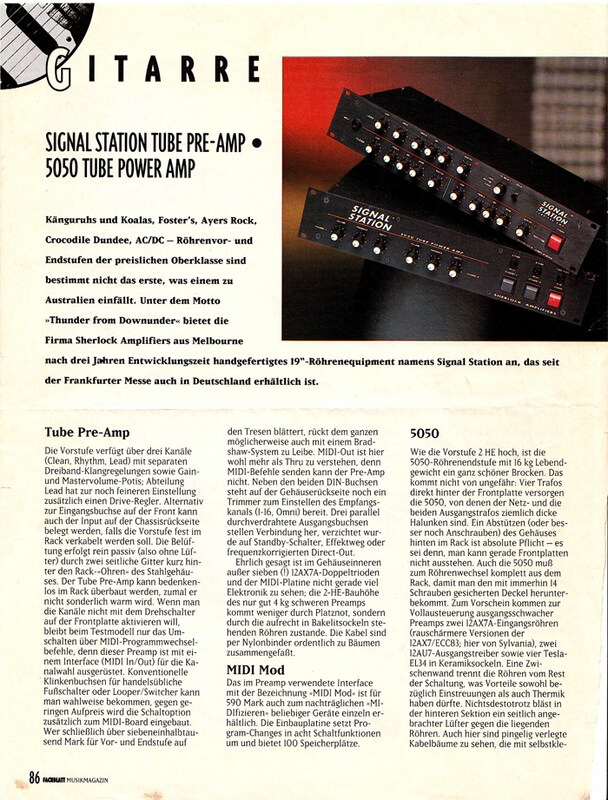 I had built many tube amps before the Signal Station gear, mainly Hi Fi amps but was I still hungry. It was time to to grow, get bigger, to learn more about tube amps so I came down off the mountain and headed for the city. An opportunity opened up at a well know guitar repair shop in Hawthorne. As amps and guitars go together, I thought that this would be a great opportunity to increase my knowledge of amplifiers, electronics and guitars.The guy that had his electronics repair business with Brenden and Ian, the two Lutherers that owned and operated Real Guitars, left for some reason so I moved in. It took some time to feel comfortable being in this new environment working with Brenden (guitarist from Madder Lake and Ian, well known bass player from Rock Steady and many other bands) but after awhile I settled in, shaved of my mountain beard and got stuck into all the repair work that flooded the shop on a daily basis. Over time I had so much work It was difficult moving around as I only had two small rooms out the back, so I moved up stairs taking up the most of the 1st floor level and eventually half of the building next door as well. The Signal Station gear was moving along nicely until one day rack gear took a death plunged and heads and combo became the norm. Unable to get some head and combo versions of my amps designed and into production due to the enormous amount of repair and custom work I was doing at the time I decided to to put my amps on the back burner. But after a while the urge to design became too strong and also having continual requests I started work on the head versions of my gear in my spare time. By this time I had made some custom tube heads for various players and my head was flooded with ideas. I also had the privilege of seeing, hearing and working on just about every tube amp that was ever made so I had a pretty good idea what I wanted to build. 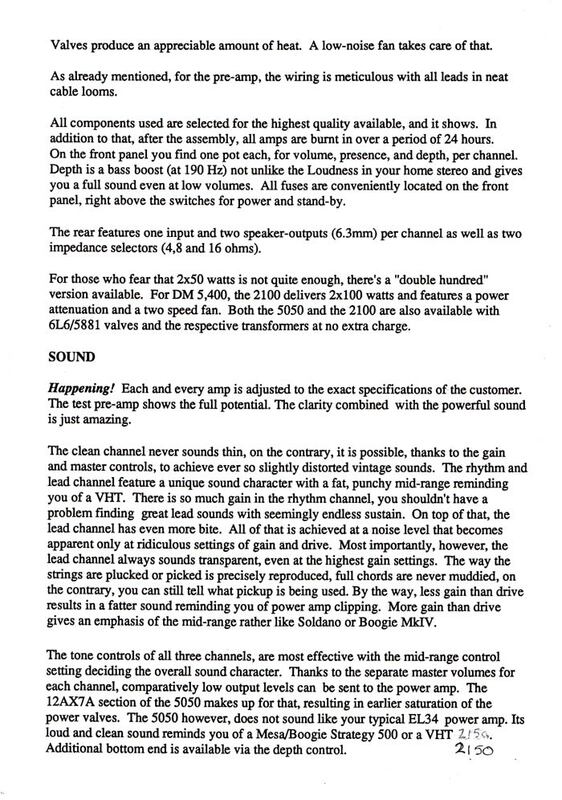 I was also developing a critical ear for tone and my guitar playing skills were improving as I had every guitarist that picked up his amp teach me a lick or two and believe me I meet and heard some very hot players in that shop! After about 7 years at Hawthorne while doing all the electronic repair work and having developed the first version of the Fat Head amp, the Tremit tremolo pedal, the 9v power supply and many other pieces of gear in my spare time, I decided to get serious about manufacture again. I had learnt my trade, so to speak, as a full time repairer, in fact more to the point I was burnt out, I needed a change, a new environment, so I moved out of the building at Hawthorne, much to the dismay of the guys at Real Guitars and into a very large shop in Collingwood. Athough I now had more than enough space to build amps, it proved to be a disaster as i was barely covering costs and going backwards finically. After about a year I pulled the plug and move the business out of the shop and setup a workshop at home in Templestowe to minimize costs and get back on my feet financially again. Moving twice in a short period of time was not good for business. I lost most of my customers. I was now surviving on a trickle of repair work. In contrast to the shop years, I now had plenty of time on my hands. I seized this opportunity to focus on amp design and manufacture. I started work on several projects including the final stages of the Fat Head design. Then one day one of my old customers, Paul Webber tracked me down and said, I want to buy an amp, do you have any suggestions? Well it just so happens I have an amp that you would love but it’s not quite ready for sale yet. Paul owned one of my Signal Station tube power amps so he knew what my gears was like. There was still a lot of work to be done on the Fat Head and Paul was quite happy to wait several months for it to be finished. Thanks to Paul the next phase of Sherlock Amplifiers had begun! 400 watt DJ amp consoles for Nick from Top Dog Entertainment, one of my DJ customers, not to mention a ton of repair work as slowly my customers eventually found me again. 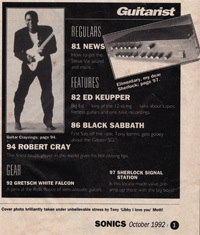 See the news page for the next chapter or the second new beginning of the Sherlock Amplifiers story. And of course, Sherlock Amplifiers would no have been possible without the help and encouragement of many people over the years. In order of appearance on the scene, they include: Steve Pearce, George Neotufus, Brenden Mason, Ian Holding, Walter O'Neill, Mark McDude Singleton, The lady who designed the logo, Rod Davies, Eric Martins, Tony Graham, Fred Grasham, Tony Neilsen, Gavin Vance, Peter Whally, David Baxter, Nick Dube for this great website, David Cook and Bruce Leech from my Ansett days for getting me started on tube amps all those years ago and many more. Thanks Guys!